I was so excited on Wednesday when I received a call from my fence contractor that they could start work the next day! Since Fridays are my off day at work, I asked if they could come today instead. They did. They arrived with the big truck and all the equipment. 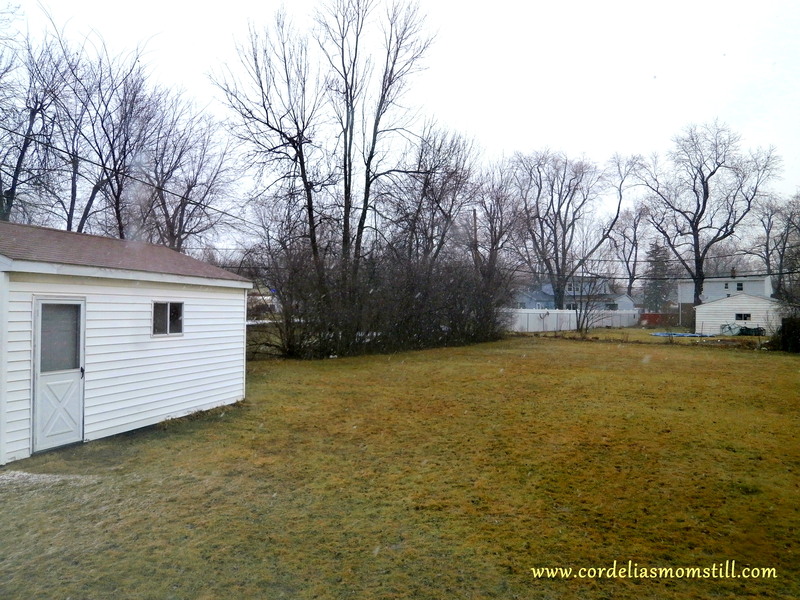 But then the crew foreman and I walked the yard to clarify the exact location of the fencing and posts – and it quickly became apparent that, although the snow is gone, the ground is too soggy for them to work. They could probably dig the posts, but their equipment would destroy the yard. After consulting with hubby, it was decided that we must wait for spring. Even though we really don’t want to. But neither do we want to have yard damage repaired in the future. Another month or so of walking Puppy Cody on leash. For perspective, here’s a photo of the back yard taken last week – look how tiny hubby and Cody look because they’re so far away. 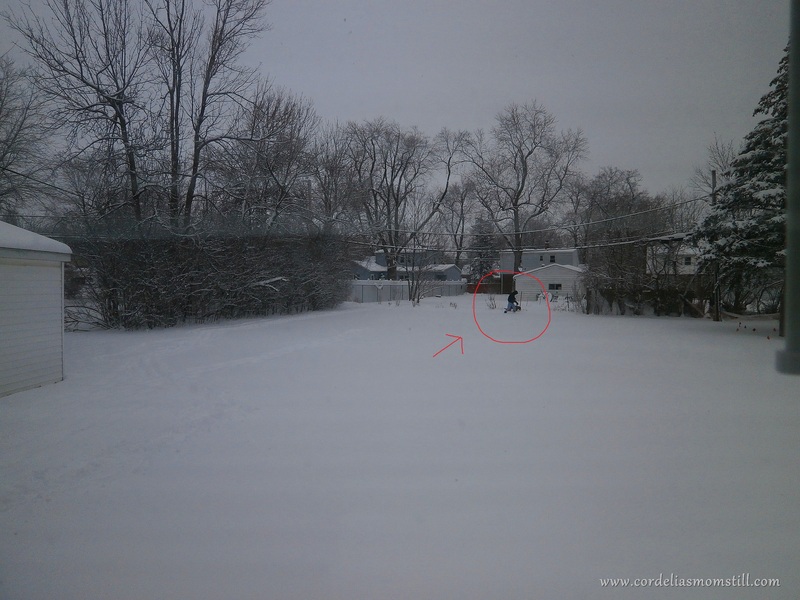 CAN YOU SEE HUBBY AND CODY IN THE CIRCLE? This entry was posted in Pets, That's Life and tagged dog, fences, houses, Puppy Cody, spring, winter, yard. Bookmark the permalink. Better safe than sorry, and at least your contractor was considerate enough to tell you about possible machinery damage to your garden. We have just spent three hours putting in a fence post (just one, by hand with a shovel and spirit level) to support a post already there as it was rocking a bit too much in recent gales of 62mph. We had hoped to simply cement it in but discovered on digging down to do it someone had already tried but hadn’t used enough to support it. Rather than try and take it out, it was easier to put in another. Not only is it cemented in, it is also bolted in four places to the uprights of the fence! It ain’t goin’ anywhere!!! You are way more ambitious than I am. No way would I do post-digging! Naturally, I’m disappointed that my fence has to be postponed – again – but it’s for the best. At least I have some comfort knowing this contractor actually shows up. Do not feel bad, as a coach, teacher, and dad to what seems like 600 babies, all of my projects pretty much have to wait for summers when I am off. I feel your pain. Thanks, Jake. I know I have to be patient, but it’s just sooo hard. Perhaps you should hire letter carriers to do this job. Neither snow nor rain nor heat nor gloom of night will stay them from getting the job done. I’ll ask my mail carrier if he can dig a fence post hole. I’m not hopeful, though – my carrier looks like he’s been working for the post office ever since it started with Pony Express. Now there’s a man who loves his job. Yeah. The crew would have done the work if I insisted, but it didn’t make sense to do so. Thanks. Mother Nature likes to play with us. This week and next week it’s supposed to be quite mild, but some rain. Then, of course, there will probably be more snow. Ugh. And it’s only the middle of February with snow tomorrow. UGH. I keep thinking it’s gotta be OVER already! It does seem like it’s been a long winter, Marilyn. Hopefully there won’t be too much more of it. I know how much you want to let Cody run. It will be soon. You will be glad you waited. Your yard in huge. Thanks, Jane. Patience is not my strong suit. Here’s to eventual spring and the new fence coming for you, CM. Thanks, Mark. Everyone will be glad when we get that fence – except, of course, for the bunnies and squirrels. I know it’s getting closer, Amy, but it’s so hard to wait. I’m looking forward not only to letting Cody run in the fenced-in yard, but also to being able to enjoy my yard this year. I may even do a little gardening. Couldn’t do that in the last place because I didn’t want to be outside near my loony neighbors.